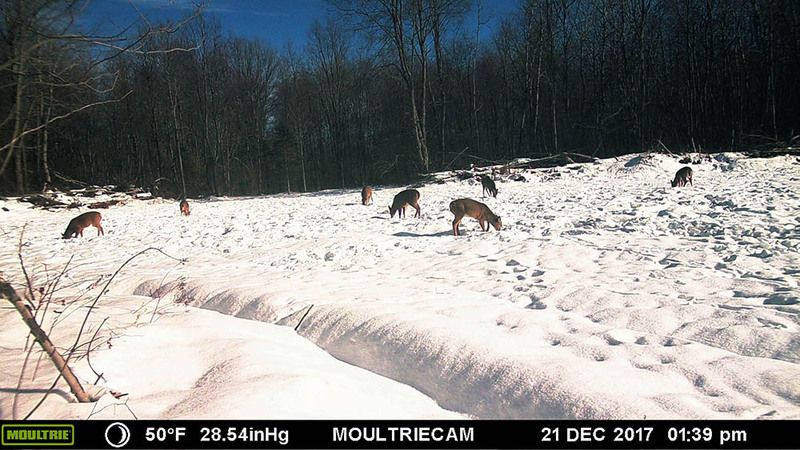 Every year we have tons of left over photos, either we took ourselves or photos taken by our Moultrie Trail Cameras. We decided to pick out a bunch and share them with you. Enjoy. Forty five days after planting our Real World Soybeans. Note, this photo was taken two weeks after spraying Glyfo directly over the plot. The same plot and photo location on October 10th. Same Plot a couple days before Christmas. Deer are still finding beans but by Jan 1st all beans were consumed. A random gobbler looking for food in our soybean plot. 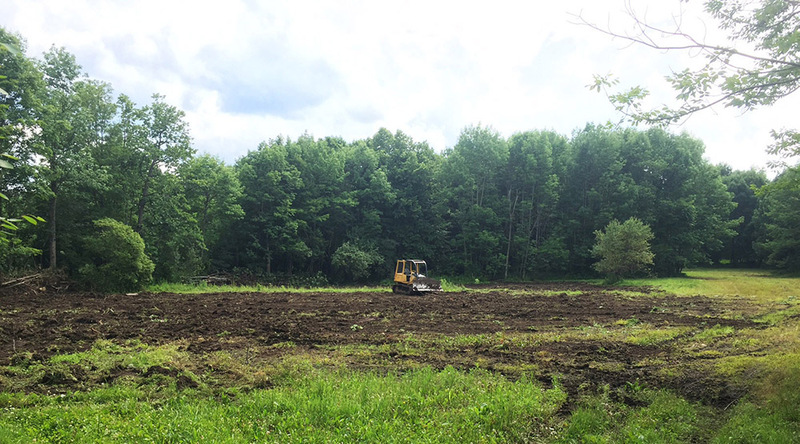 Food Plot 2 got half an acre bigger this year thanks to my Deere 450H dozer and one full day of nice weather. Getting equipment, lime and fertilizer to your plots is half the battle. This swamp was a nightmare for years so with my excavator, dozer, road fabric, culvert, and four loads of crushed stone this road is no longer a problem. Here's a decent buck cruising a few days before peak rut. My wife Julie is impressed with the size of our Hancock White Globe Turnips in Plot 7. These Hancock turnips were exceptional this year. You can also see the austrian peas vining. This buck was our #1 however he was killed opening week of rifle 1 mile away. He showed up early October. This mature buck was our #2 and he surived the hunting season. We had several photos of black bears in our Frosty Delight Plot. The date is wrong on this camera, it was early October when this pic was taken. Here's our #3 who was captured several times in our Frosty Delight plot. Again, date is wrong on this camera. Our #2 was crusing our big plot in mid-November. This is Plot 7 in late December. The weather warmed up and the deer were out in force on our turnips here. 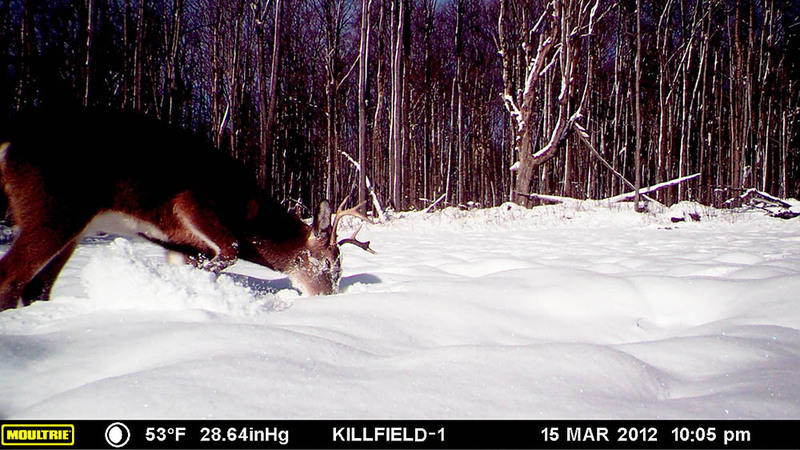 This little buck is digging through a foot of snow to get at the greens and turnips. This is why we plant so many brassicas here, we get a lot of snow up here. I have no idea what was going on here but the photo was incredible so I'm sharing it. My guess is a coyote showed up and the trail camera hit it perfect. 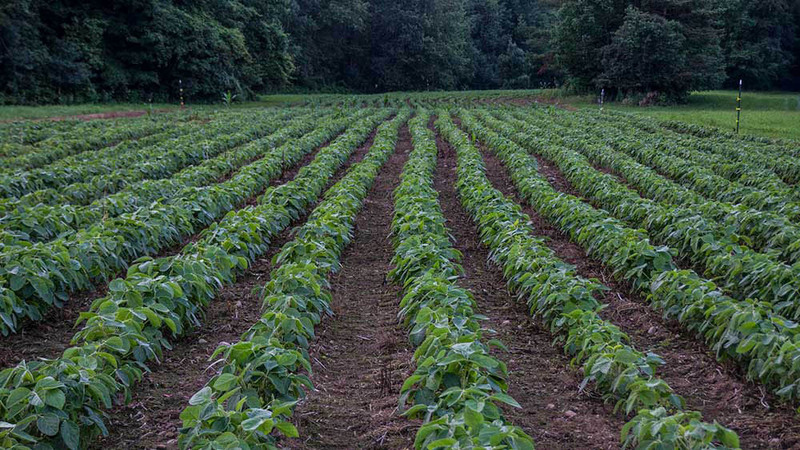 Here's what Plot 4 looked like after I planted frosty delight. I use a Precision seeder which tills, seeds, and packs all in one pass. You can see by the pooling that we had a tough time getting a dry window to plant. Luckily we made it work. Keeping bucks on our property during the rifle season is our top priority. This buck would be dropped in seconds on many of our neighboring farms. He hung out on us and I passed him up once this year, and he survived. He'll be better next year. Our number one goal is to provide tons of nutrition so does and bucks alike have a better chance of surviving our winters.